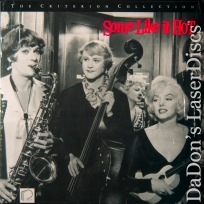 Some Like it Hot 121 min. - Black and White Genre: Comedy Not Rated Country: USA LaserDisc Movie Storyline: Billy Wilder's classic comedy stars Jack Lemmon and Tony Curtis as a pair of unemployed musicians who inadvertently become witnesses to the St. Valentine Day's Massacre. To escape the wrath of the gangsters, Joe (Curtis) and Jerry (Lemmon) are forced to hit the road in drag, taking the only jobs available with an all-girl band bound for Miami. Enroute, both men fall for lead singer and blond bombshell Sugar Kane, (Marilyn Monroe), but are unable to fulfill their desires for fear of revealing their identity. Joe tries to get around this by adopting a third identity for seduction, that of a shy millionaire who sounds strangely like Cary Grant. Meanwhile Jerry has his own problems, fighting off the advances of Osgood E. Fielding, a real millionaire hypnotized by his/her charms.